AN exciting new art exhibition opens at Mussel Inn Glasgow’s Gallery on April 9 and runs until May 31. Ripple Effect 2 features six renowned artists from Britain, Norway and France who have adopted the lesser-known medium of monoprinting. The exhibition, which comes to Glasgow after a successful run at the Scottish Arts Club in Edinburgh, features work from Doreen Boogert, Kate Downie, Anna Kristin Ferking, Laura Gressani, Karen LIoyd, Silvana Mclean. 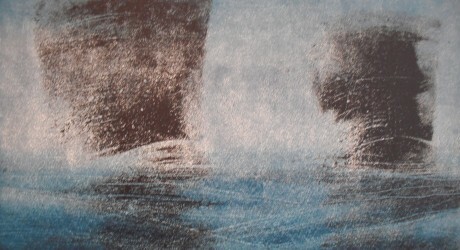 Monoprinting is technically the simplest form of printmaking. It seems to have been forgotten and rediscovered several times and then circulated among groups of artists. Ripple Effect 2 reflects the variety of approach to a single medium while allowing viewers to trace the exchanges that have taken place among this informal group of artists. Artist, Kate Downie, said: “When you throw a stone into a pond, the water ripples travel out in all directions, touching other things, effecting small but significant changes over time. “I started teaching monoprinting techniques about a decade ago so I could share my passion for this versatile and dramatic medium. “Monoprinting is a little like chess; simple to learn with a few basic rules, but with endless permutations to explore and develop. I had no grand plan of where this might lead or how popular the classes would be. “A decade on, I am delighted to be exhibiting alongside just a handful of the many talented artists who are busy taking monoprinting to new places, from those first workshops over an old etching press. Private viewings will be held on Saturday 9 April 12-2.30pm and Saturday 7 May 12.2.30pm. Canapés and wine will be served. To join Mussel Inn and the artists at these private viewings call 0843 2892 284. Located at 157 Hope Street in Glasgow, the award-winning Mussel Inn is renowned for its passion for art and its offering of delicious locally sourced fresh seafood.